The screenshot below displays an example of a store locator application for fictional clothing stores. A database in MySQL stores information about individual clothing retail stores, like the store name, address and geographic coordinates. The map uses an XML file that acts as an intermediary between the database and the map. You can use PHP statements to export marker information from the database to the XML file. When the user enters a location in the Search location field, selects a search Radius, and the clicks the Search button, the map retrieves information from the database, and adds markers to the map. A user can click the markers to display info windows with store information, and also click the See all results drop down list to view a list of all stores in the search radius. The sample below shows the client-side code you need to create a store locator application. Hover at top right of the code block to copy the code. Create a table in MySQL containing attributes of the markers on the map, like the marker id, name, address, lat, and lng. The id attribute serves as the primary key. When using a public browser to access a database using PHP files, it's important to ensure that your database credentials are secure. You can do this by putting your database connection information in a separate PHP file to that of the main PHP code. Create a new file in a text editor and save it as phpsqlsearch_dbinfo.php. The file with your credentials should look like the one below, but containing your own database information. 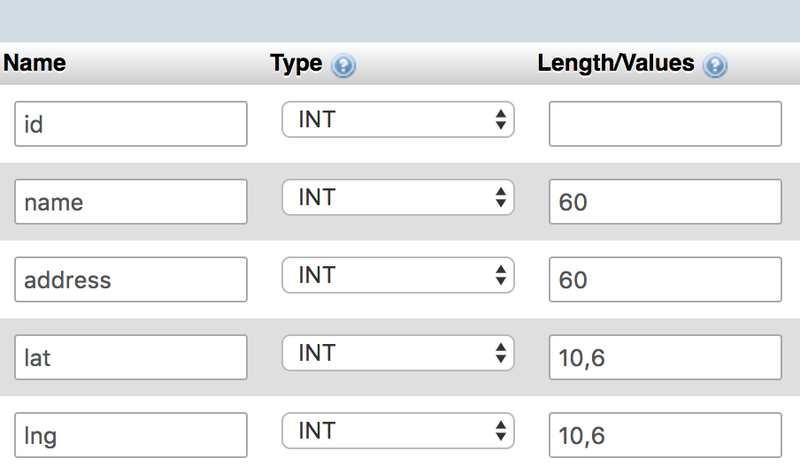 To find locations in your markers table that are within a certain radius distance of a given latitude/longitude, you can use a SELECT statement based on the Haversine formula. The Haversine formula is used generally for computing great-circle distances between two pairs of coordinates on a sphere. An in-depth mathemetical explanation is given by Wikipedia and a good discussion of the formula as it relates to programming is on the Movable Type Scripts website. Here's the SQL statement that finds the closest 20 locations within a radius of 25 miles to the -33, 151 coordinate. It calculates the distance based on the latitude/longitude of that row and the target latitude/longitude, and then asks for only rows where the distance value is less than 25, orders the whole query by distance, and limits it to 20 results. To search by kilometers instead of miles, replace 3959 with 6371. Create a new file in a text editor and save it as storelocator.php. Copy the code below to the storelocator.php file to connect to the MySQL database, and dump the XML to the browser. Since this PHP sends user input in a MySQL statement, this code uses the mysql_real_escape_string technique of avoiding SQL injection. A more elegant solution may be to use MySQL prepared statements, though implementation varies on the PHP version and DB wrapper used. If your database contains international characters or you otherwise need to force a UTF-8 output, you can use utf8_encode on the data output. To confirm that the PHP script is producing valid XML, call the php script file you created from your browser to see the XML output as below. You can do this by appending reasonable sample query parameters to the URL (for example, ?lat=-33&lng=151.2&radius=100), and you should see XML output like the code below. Create a new file in a text editor and save it as index.html. You can find the full sample code that creates the map in this tutorial at the beginning of this page. Copy the entire code and paste it in the index.html file. The sections that follow explain the code that creates the map. that youRead the sections that follow to understand the code that you can add to this file. 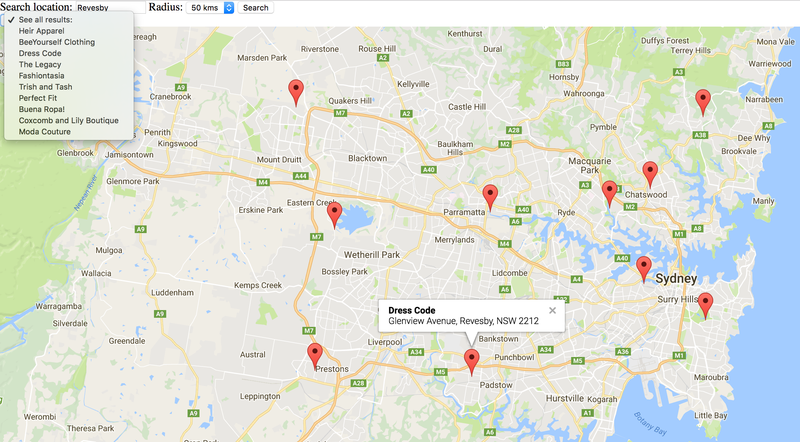 You can customize the layout of the map to allow your store locator application to display nicely in a mobile browser. Instead of using a sidebar to display a list of all the search results, you can use a dropdown menu which displays the store locations in a large, easy-to-read list. You can set the CSS width of your dropdown menu and map to be 100% to ensure that it fills the mobile screen space. When a user enters a location in the Search field, the PHP script requires latitude and longitude parameters in order to perform the search. The map script uses the Geocoder class to turn the user-entered location or address into a latitude and longitude coordinates. The code below attaches the Search button to a searchLocations function, which passes the user-entered location/address from the Search field to the asynchronous geocoder.geocode function. If the geocode was successful, and the geocoder.geocode function gets a LatLng in response, it sends the coordinates to the searchLocationsNear function. The code passes the geographical coordinates of the location the user entered in the Search Near field, and passes it to the PHP script to process the XML output. Use the browser-provided XMLHttpRequest object to load the XML file into the page. This object lets you retrieve a file that resides on the same domain as the requesting web page, and is the basis of AJAX programming. Define your own function for loading the file, and call it downloadUrl(). The code below dislays the url parameter which specifies the path to the PHP script. It is beneficial to have this reside in the same directory as the HTML so that you can just refer to it by filename. Since the XMLHttpRequest is asynchronous, the callback parameter initiates the downloadURL function based on the size of the XML file. The bigger your XML file, the longer it may take. For this reason, it is best not to put any code after the downloadUrl function that relies on the markers inside the callback function. Instead, you can put such code inside the callback function. Now that you have defined the function, you can call it from your code, passing in the storelocator.php file and callback function. The map in this tutorial calls a static XML file for the marker data, as in the code below. For each marker element, the code above retrieves the id, name, address, distance, and lat/lng attributes, and passes them to createMarker() function to create the marker, and to the createOption() function to create a result in the See all results drop down. You can use the LatLngBounds.extend and Map.fitBounds functions to calculate the optimal viewport for the results. The code below creates a marker at a LatLng using the createMarker() function, and adds an event listener to the marker that displays an info window when the user clicks a marker. In the code below, the createOption() function creates an option element that displays the name of the store. The value of the option is the index of the marker in the global markers array. You can use this value to open an info window over the marker when the user selects a corresponding option on the 'See all results' drop down list. In the code below, the clearLocations() function sets the map property to null in order to clear any existing markers, info windows and drop down lists between searches. The code then sets up the map. The user can use the 'Search Near' field to enter a location name, and select a search radius to display markers on the map. The map also binds info windows to each marker that displays the store name and address. Now that you have a store locator for your website, consider extending it with more features. User location: The Android phone provides a Gears Geolocation module for determining the approximate location of a user, and the iPhone supports the W3C geolocation property. You can use this information to do a default search for the user when they first arrive at your page, and minimize the amount of typing they need to do. See this example. Advanced search: Let users restrict searches by category or some attribute. Check out the Ace Hardware store locator for a great example of this. Richer info windows: You can provide more information in your info windows by adding quick links for the user to zoom into a location, or provide get driving directions to or from a location.